Wirex is an application and account that lets you remain in control of both traditional financial assets and cryptocurrencies. The company began its life as E-Coin in the form of a provider of virtual cards. Its expansion of services led to the change in name to Wirex, which took place in February 2016. The company offers a personal banking solution that is a hybrid between traditional banking and cryptocurrencies. Wirex claims to be the first company to combine the acceptance of fiat currency with the blockchain’s flexibility and speed. There are secure wallets for Litecoin and Bitcoin with support from mobile and online applications. Wirex has successfully integrated technologies for global payments and peer-to-peer transfers, allowing for service you can use with just several clicks. The company also protects privacy, enhances security, and improves the customer experience. Wirex works to constantly improve its services and products to better meet the needs of clients. In terms of size, Wirex has a transaction volume of $2.0 billion and it has 1.8 million users. Wirex headquarters are in London and there are additional offices in Kiev, Ukraine and Tokyo, Japan. It supports around 130 different countries, but not the United States. Wirex feels that everyone should be able to play a role in the financial revolution. The company wants to make it possible to use both traditional currencies and cryptocurrencies in daily finances instead of having to choose one or the other. Additionally, Wirex feels that everyone around the world should be able to access banking services. To achieve that goal, Wirex only requires internet access to use it. There is no paperwork to fill out and the company does not take off weekends or have closing hours. Finally, Wirex wants to eliminate geographical limitations within finance. Essentially, this means that it believes you should be able to send money to anyone anywhere within seconds. Using Wirex, you can connect your credit and debit cards. The application lets you store cryptocurrencies, including Bitcoin. It is also possible to purchase Bitcoins and other altcoins with great exchange rates and high limits. Or you can exchange cryptocurrencies for fiat currency. Wirex also supports transferring digital currencies between users anywhere around the world without a fee. Or you can transfer money to someone with very low fees compared to traditional services to send money. This is a Visa card that is contactless and lets you make payments using your Wirex account. Thanks to the use of this card, you can essentially spend your cryptocurrency just like you would any fiat currency, including in restaurants, stores, or on public transport. 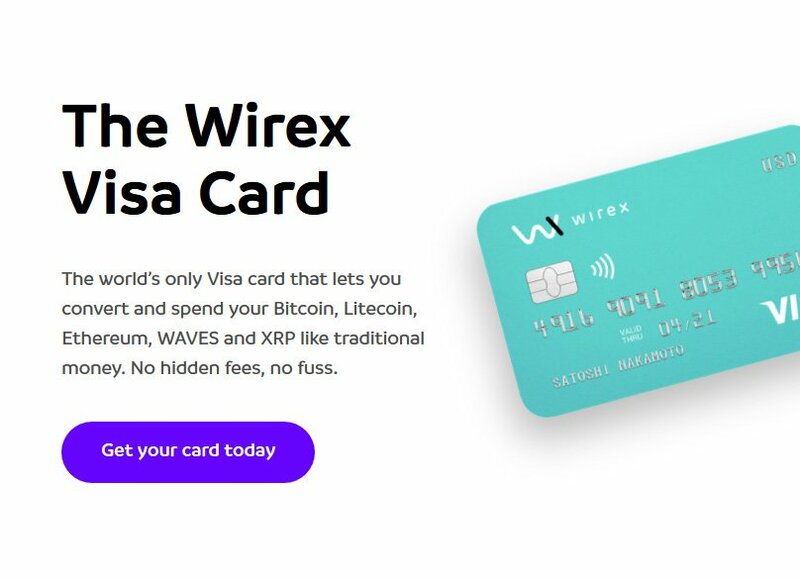 Wirex markets this as the only Visa in the world that lets you convert crypto into traditional money and then spend it as such. The card allows for instant conversion of cryptocurrencies so you can spend them in real time like fiat currencies. This works for Bitcoin, Ethereum, Litecoin, and Ripple. The card works anywhere, including stores, restaurants, online, and ATMs. You can choose to get a card with GBP, EUR, or USD as the base currency. It is even possible to opt for all three. With the Wirex Visa, you get exchange rates that beat those offered by the banks, without any commissions or hidden fees. The application provides support for managing your budget and tracking your spending, including instant alerts. When using the Wirex Visa card, you also get to earn exclusive Cryptoback rewards. These are automatically awarded whenever you spend in stores. 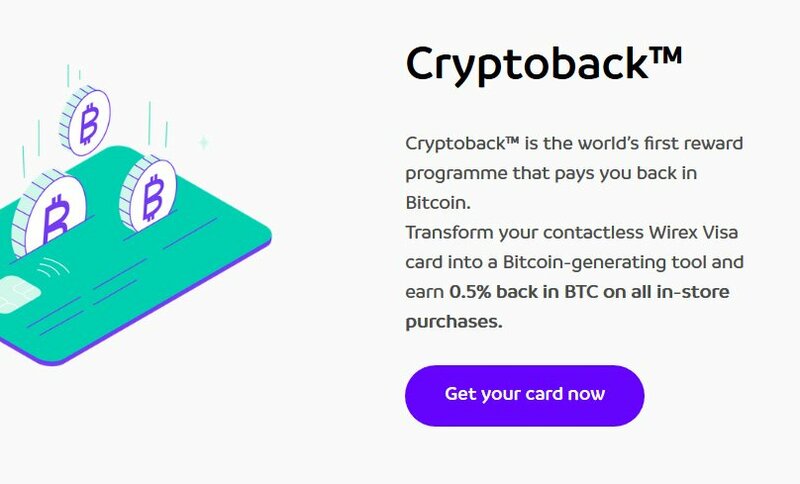 This program lets you earn 0.5 percent back in Bitcoin whenever you utilize your card to pay on transport, bars, restaurants, and shops. All of the Bitcoin you earn this way is instantly redeemable, including the ability to spend and/or convert it. To add funds to your Wirex Visa card, you just add money to your Wirex account. This can be done with any of the funding options, such as credit or debit cards, depositing cryptocurrency, or a bank transfer, among others. If you opt for the GBP card, it will be a Visa debit card that has a bank account number as well as a sort code. If you opt for the USD or EUR card, it will be a prepaid card. In any case, the card’s balance is linked to the Wirex currency account. As mentioned, Wirex offers Cryptoback rewards. These allow you to earn 0.5 percent back in BTC on all of your purchases made in stores with the Wirex Visa card. Wirex also offers a Refer-a-Friend program. This lets you earn Bitcoin for free by inviting family and friends to join Wirex as well. With this program, you and your friends each earn as much as $10 in the form of Bitcoin. To participate in the program, start by sharing the unique referral link, which you can find in the app’s Rewards section. Your friends sign up and get verified, which takes about two minutes and two steps. When your friend purchases $100 worth of cryptocurrencies using their debit or credit card, both of you receive $5 in BTC. When your friend orders their Wirex Visa card and makes their first purchase in-store, regardless of purchase, you each get another $5 in BTC. To make these reward programs stand out, there are no limits as to how much you can earn from either program. Both of these rewards, Cryptoback and Refer-a-Friend are awarded in Satoshis, the subunit of Bitcoin. You can redeem these Satoshis anywhere and at any time, either online or via the application. Redeem them into your Wirex Bitcoin wallet and store, spend, or exchange them however you like. Wirex lets users choose from one of six different currency wallets. All are secure and have features like cold storage for cryptocurrency, traditional currencies, and multi-sig functionality. This includes your choice of four crypto wallets, each of which is easy to use. The wallets let you buy, store, or manage both crypto and fiat. Supported cryptocurrencies include BTC, LTC, ETH, XRP, and WAVES while supported fiat currencies include GBP, EUR, and USD. It is also possible to instantly exchange between these fiat and cryptocurrencies using live rates so there are no surprises. There are many ways to add funds to the wallets, including via a bank transfer, debit card, or credit card. You can also link the Wirex Visa payment card to your wallet, which allows you to convert, then spend cryptocurrency online and in-store. When you choose a cryptocurrency wallet from Wirex, you get access to the ability to instantly exchange cryptocurrencies with traditional currencies using live rates. You can fund your wallet with a bank transfer or a credit or debit card. To spend the cryptocurrency, connect your wallets to the Wirex Visa card. If you opt for a traditional currency wallet, you can order a card in GBP, EUR, or USD. This is great for traveling as it helps lower merchant fees and high exchange rates. You will also get exchange rates between USD, GBP, and EUR that are better than those offered by banks if you opt for a fiat wallet. Unlike the competition, Wirex does not charge commissions or fees. Simply register on the Wirex website and your account will be up and running in minutes. You can also start by downloading the Wirex application onto your smartphone from the Apple App Store or Google Play Store. From there, just register and verify your account in the same manner. Select whether you want a USD, EUR, or GBP account and enjoy instant availability. Now, you can manage your funds wherever you are and at any time of the day. One of the many great features of Wirex is the ability to exchange currencies with very competitive exchange rates and no commissions or fees. You can purchase traditional currency or cryptocurrency in just two steps, making this process incredibly straightforward. Start by loading funds into your Wirex account using a bank transfer, debit card, or credit card. From there, log into the website or open the Wirex application and follow the on-screen steps to convert funds to BTC, LTC, ETH, WAVES, or XRP, or into GBP, USD, or EUR in just a few clicks. You can use fiat currency to buy cryptocurrency or vice versa. Another great feature of Wirex is the ability to transfer money across the world without any hassle and with very low fees. Most current solutions require you to pay high exchange rates, commissions, hidden fees, and unexpected charges. With Wirex, you get highly competitive rates when sending USD, EUR, or GBP to any destination in the world. In the case of a crypto transfer, you can convert the cryptocurrency in question into a traditional currency without any commission; you just pay the conversion rate. To make a money transfer, start by loading money into your Wirex wallet via bank transfer, debit card, or credit card. If you load cryptocurrency, it will automatically be converted into one of the three supported fiat currencies for transfer, with the chosen fiat currency reflecting your preferences. You can then choose if you want to make the transfer using cryptocurrency or fiat currency. Select the currency and enter the amount to send. From there, you will be prompted to enter the wallet address of the recipient. If the person you want to send funds to does not have a wallet, they can get a free one from the Wirex application. At this point, just click confirm. The transfer typically takes about ten minutes, but it may take up to an hour. Wirex stands out from the competition with its transparency and fairly low fees. In fact, there are no commissions or transactional fees. Instead, you just pay the price you see for every type of exchange. There are no fees associated with the mobile application, multi-sig wallet, e-money account, security features like two-factor authentication, card issuance, card delivery, or cryptocurrency AML. The only fee related to these services is for card management. Even so, this fee is very small compared to other similar options, just £1.00/€1.20/$1.50 each month. The lack of fees continues when it comes to top-ups as there is no fee, whether you top up via cryptocurrency, credit or debit card, or bank transfers. Most transactions are also completely free. You will not pay any fees for cryptocurrency exchanges, fiat exchanges, Wirex crypto or fiat transfers, online card purchases, in-store card purchases, or cashback in stores. There is a small fee for using ATMs, which is common for similar services and lower than the competition. Within Europe, the fee is £1.75/€2.25/$2.50 or it is £2.25/€2.75/$3.50 outside of Europe. Wirex wants to appeal to all clients, which is why it works to deliver minimal limits as well. There are no limits for exchanges, deposits, online card purchase, or in-store card purchases. The limits that Wirex does impose are very reasonable and competitive. In most cases, it is unlikely that the average client will become frustrated with these limits. The limit for cashback in-store is £50 per day. There is a transfer limit of 10 BTC per day. ATM withdrawals are limited to £250/€250/$250 per day. Credit and debit card top-ups are limited to £7,500/€8,000/$10,000 per day. There is also a maximum card balance of £15k/€16k/$20k. In addition to the personal solutions, Wirex also offers Wirex Business, a business payment solution that is cryptocurrency-enabled and international. This system allows for payments anywhere and at any time, in either digital currency or traditional currencies. Wirex Business prides itself on delivering great transaction speed and unbeatable flexibility. This is possible thanks to the combination of fiat currency’s universal acceptance with cryptocurrency’s efficiency. Companies can create multi-currency accounts in their name. There is support for EUR, GBP, and 25 other currencies, so there is no shortage of options. Businesses can also use the wallets to secure unlimited amounts of Litecoin, Bitcoin, XRP, and/or Ether. In terms of payments, Wirex Business allows you to accept international payments in crypto or fiat currencies seamlessly. This ability is powered by the blockchain, SWIFT, and SEPA. Wirex Business also includes crucial features, like the ability to save details about counterparties, set permissions for each wallet, or set roles. Of course, you can also view the account activity with real-time information. Wirex Business is standardized since it lets you open a crypto-friendly account with your legal entity name. It is also streamlined as you can save, exchange, and receive payments in either fiat or crypto on a single platform. It is also simplified thanks to the ability to track financial activity in a single place and take advantage of naming and setting account permissions. Wirex is in a very select group as it is just the third crypto-friendly business that received an e-money license from the FCA. This licensing and authorization from the FCA give clients peace of mind since it indicates that Wirex must comply with security regulations. The company uses the strongest possible PCI DSS Level 1 certificate to deliver the highest level of security. 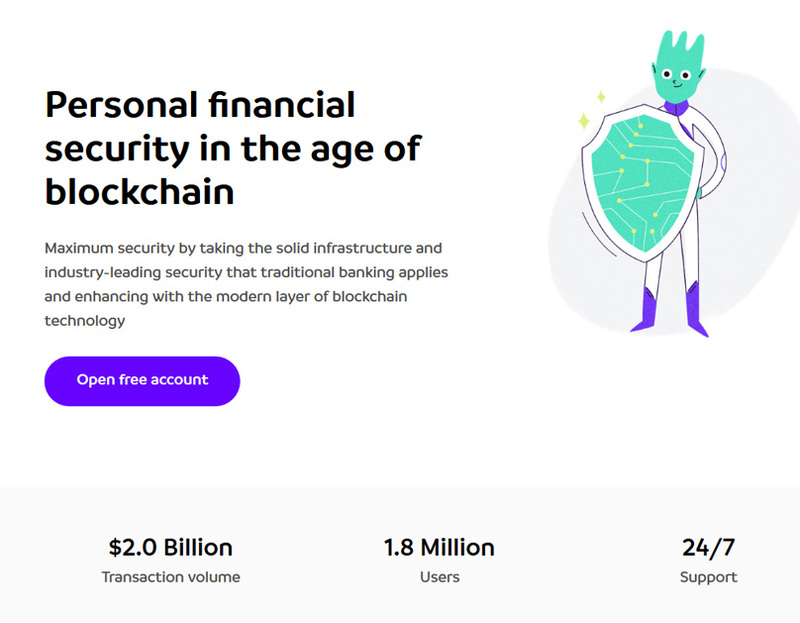 This is combined with safe transactions, fraud prevention, card data protection, secure systems and network, information security compliance, and secured wallets. To keep client funds secure, Wirex stores 99 percent of the user funds in cold-storage wallets which are multi-signature and segregated. This ensures that no one can access your money except you. Wirex also has 3-D Secure by Visa protection which reduces the risk of a payment that is unauthenticated. This decrease in risk even applies when card numbers get cloned or stolen. Between Verified by Visa (3D Secured) and the PCI DSS certification, Wirex is able to bring the risk of fraud down to practically zero. For card management, it is possible to disable and re-enable your Wirex card via the mobile application in seconds. This is perfect for those times when you lose your card temporarily. When conducting large transactions, Wirex uses smart confirmations for an extra layer of protection. To protect all relevant data, Wirex takes advantage of SSL encryption using 256-bit AES for all personal data and documents, both in transit and at rest. Wirex also uses asymmetric key encryption to guarantee that it is impossible for the company (or anyone else) to access your data without permission from you. For further security of your account, Wirex supports multi-factor authentication, which helps protect against illicit activity and fraud. There is also device verification as well as biometric verification, ensuring that the only devices that can access your account are those that you have enabled. At any time, you can view and manage the devices that are enabled for your Wirex account. This lets you delete any devices you no longer use or do not recognize in just a click. The application also allows for push notifications. When combined with text and email alerts and notifications, you will be aware of any account usage right away, so you can catch fraud right away. The financial infrastructure of Wirex is blockchain-enabled. Wirex constantly monitors this infrastructure to deliver maximum security checks all day every day. To round it all out, Wirex follows the industry best practices. Its risk management and compliance team works to ensure it always follows the best practices outlined by technology partners and regulators alike. Wirex does not list a phone number or seem to have a live chat option when on the computer. There is a live chat option via the application. Instead, the contact options are limited to emails or a contact form within the Help Center. In the Help Center, you can select “Get in Touch” by the top of the screen. This will take you to a contact form to fill out a request. You just need to enter your email, the subject, the description, and the request type, with the ability to attach files. There is also a community page that Wirex encourages users to visit. This includes a support live thread and various other topics, both with Wirex and other users. This is also where you can find information about new features. The contact page of Wirex has specific email addresses for queries regarding press inquiries, partnership inquiries, marketing inquiries, general business inquiries, customer support, and affiliate inquiries. The Wirex Help Center includes 24/7 customer support via its Support Center. The Help Center includes a convenient search function so you can quickly find the information you need. 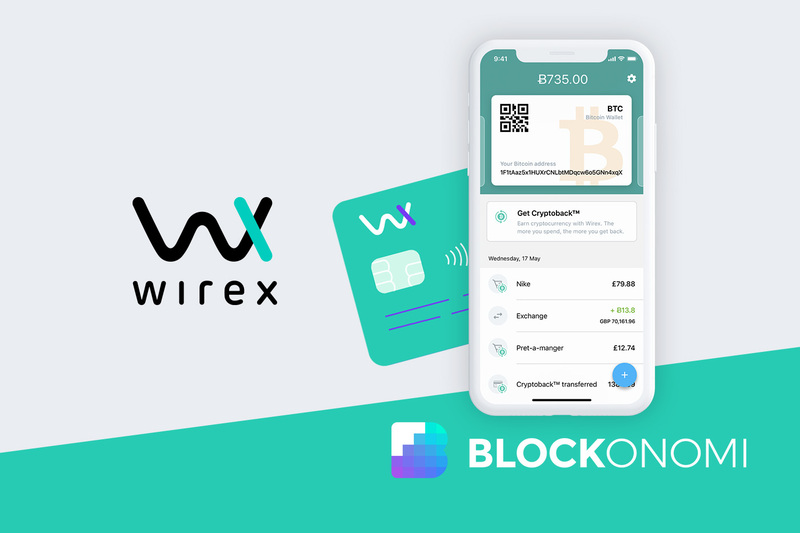 This page displays the most common queries at the top of the page and then has the rest divided into six categories: Getting Started, Card, Manage Funds, Fees and Limits, Wirex Mobile App, and About Wirex. Each category has its own range of topics. This means that most information you need can be found within the Help Center. If you cannot find an answer to your question, you can click “Get in Touch” by the top of the page and fill out the contact form. Wirex will get back to you in a timely manner. Wirex is an account and application that lets you store fiat and cryptocurrency in the same account, accessing it via a single application. There are multiple different Wirex wallets available depending on the currency you wish to store. Wirex also stands out with its Wirex Visa card, which acts as a debit or prepaid card and lets you make purchases anywhere that accepts Visa. This means that you can use the crypto in your Wirex account to buy groceries, go shopping, dine out, or spend online. Wirex takes multiple security measures and is authorized by the UK Financial Conduct Authority, giving clients additional confidence in its security. It should be noted that there seems to be some trouble with their password recovery system at this time. During our testing period we received an email saying that my password had been reset by their system, this is possibly due to recent data breaches so it’s a good thing they are being proactive about protecting customers. Unfortunately there are now complaints about this online, with customers saying they are having trouble getting back access to their accounts. This was true for us as well, we had to request a new password multiple times before the email actually came through after a delay. This shouldn’t affect new customers can be an a frustrating experience for existing customers who have temporarily lost access to their account. Wirex is not available to residents of the United States at this time but is constantly expanding their coverage around the world. You can see a list of supported countries on their website here. Ultimately Wirex looks to be a great offering, by bridging the gap between fiat and crypto and allowing you to spend your cryptocurrency in shops and restaurants this is a step forward for bringing adoption to the industry. Unfortunately, due to Crypto regulations around the world you will need to be aware of any tax obligations – as purchases currently count as taxable events in most jurisdictions.